Jessica Hynes is best known for her comedy, having co-written and starred in seminal sitcom Spaced and been a staple of shows like The Royle Family and W1A – all of which find humour in the everyday. 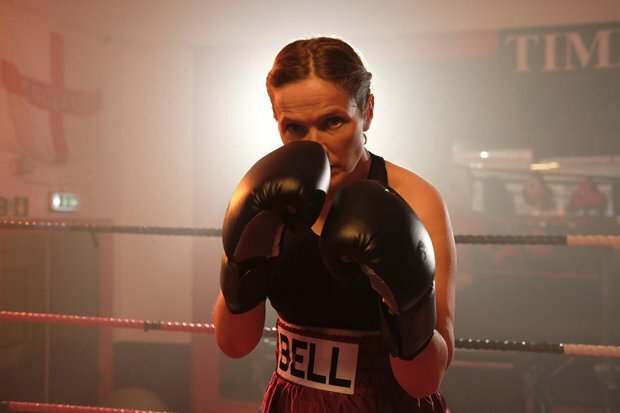 With her directorial debut The Fight, she proves equally adept at mining life's daily dramas, delivering a body blow of a film which is less about sporting glory, and more about healing emotional scars. Alongside writing and directing, Hynes takes the lead as harried mother-of-three Tina Bell. Work as a care assistant and the relentless drudge of family life leaves her permanently exhausted; her husband, Mick (Shaun Parkes), is helpful but limited by his night-shift work, while Tina's relationship with her parents, particularly mother Gene (Anita Dobson), is strained. When it transpires that her sensitive daughter Emma (The Girl with All the Gift's Sennia Nanua) is being bullied, Tina can't summon the resources to tackle the issue head-on. The situation is further complicated by the fact that the bully's mother, Amanda (Rhona Mitra), is Tina's own school adversary. Backed into a corner, Tina turns to boxing in order to find both confidence and release. While such grim slice-of-life narratives are a mainstay of British cinema, and Tina's journey to self-worth is also familiar, what sets The Fight apart is Hynes' pull-no-punches approach to the female experience, and her ability to subvert expectation of both genre and gender. Tina isn't striving to have it all; she is simply looking for a happiness that continually eludes her. Her move into boxing comes as much from desperation as determination, a sense that she needs to take control before she is consumed by the rage that constantly bubbles under the surface. In both screenplay and performance, Hynes nails this aspect of Tina; she is a coiled spring, fighting to get through each day. Indeed, the film's most powerful scene comes not in any boxing ring, but as Tina, pushed to her limit by the morning routine, asks her husband for support. 'I'm on the edge and I need your help,' she pleads – an anguished admittance rarely uttered by on-screen mothers, but one that strikes a raw, resonant chord. Tina is also engaged in a battle with past demons, at first hinted at and then made clear in explosive altercations with both Gene and Amanda, which also lay bare the fact that women are very capable of bullying and abuse – a cycle of aggression that traps all those in its wake. This is underscored by repeating visual motifs, such as the family leaving the house each morning, and evocative cinematography from Ryan Eddleston (Prevenge), who captures the endless expanse of the Folkestone shoreline, or lingers on the foreboding shadows of an underpass. Moments of warmth – green leaves, purple lavender – are stark in their rarity. Crucially, the men of the piece are not underwritten or villainous: Mick is a kind, proud father whose touching interactions with Emma are particular highlights; while Tina's own father Frank (Christopher Fairbank) struggles with his victimhood. But The Fight is a story specifically – and proudly – about a woman beaten into submission by life experience and social expectations, but determined to push back. It's an absolute knockout. Selected release from Fri 15 Mar.